A nice an easy to make sweet dish prepared in minutes. 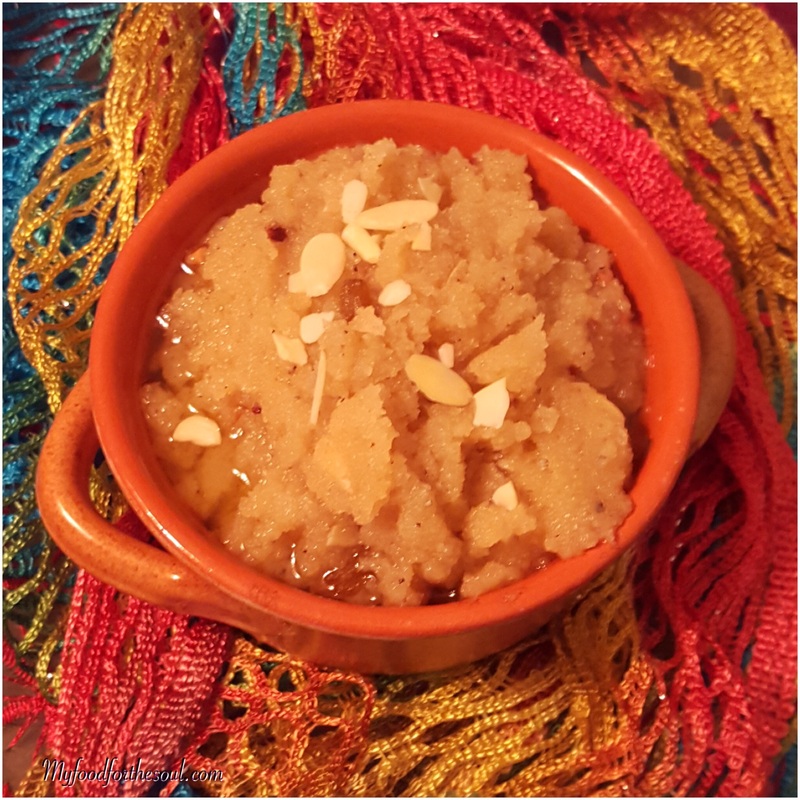 Sooji ka Halwa also known as “Sheera” in Gujarati is an all time favorite sweet dish that can be served as a dessert, breakfast sweet dish or prepared for special occasions or festivals. 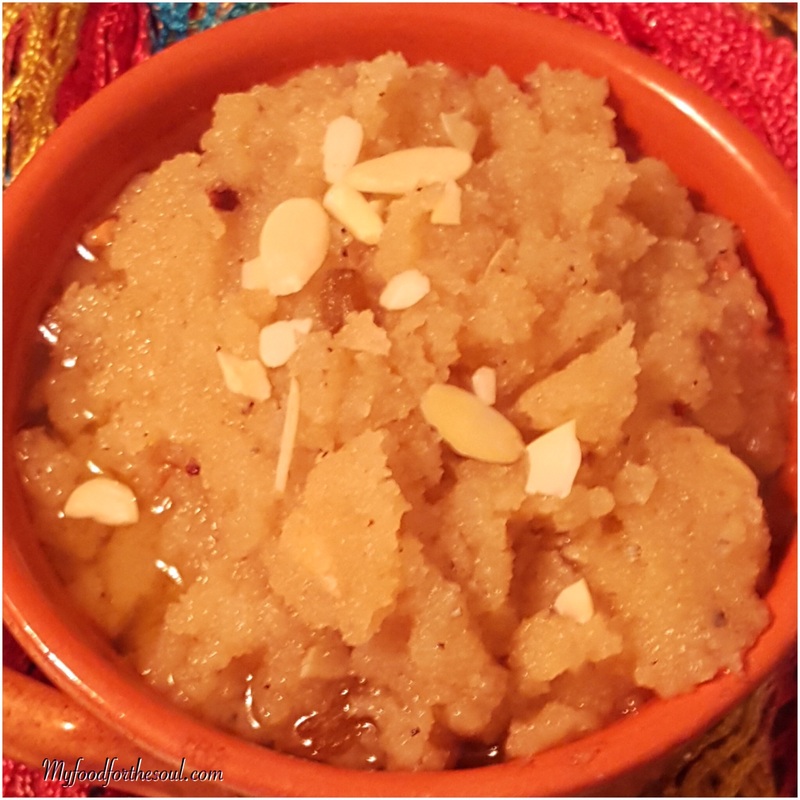 Sooji ka Halwa is a super simple and absolutely delicious dish prepared by roasting sooji also known as rava or semolina in pure desi ghee (clarified butter) cooked in warm milk with sugar and topped with your favorite choice of dry fruits and saffron. This recipe is my all time favorite, I’ve learned to make this special method of “sheera” from my mom. I’ve watched her make it numerous times as a sweet side dish for dinner, for special puja’s at home. My mum’s recipe calls for warm milk, but many people substitute the milk with water which is also fine, but I find that by adding milk to the sheera gives it a nicer rich taste and texture. Also this recipes has silvered almonds, green raisins which is optional, silvered cashews and charoli also known as chirongi nuts or piyal seeds and saffron to give our sooji ka halwa a nice flavor and color. I’m sure a lot of us have already heard of semolina also known as rava or sooji. But did you know that it’s not just commonly used in Indian cuisines it’s also very popularly used in many other cultural backgrounds like Europe, North Africa, West Africa, North America and South America to make pasta, pudding, breakfast cereal and couscous. Semolina is a grain that is very versatile can be used to make sweet dishes, savory dishes, baking and I’ve read and some what believe that it also has some amazing health benefits if consumed in the correct manner. 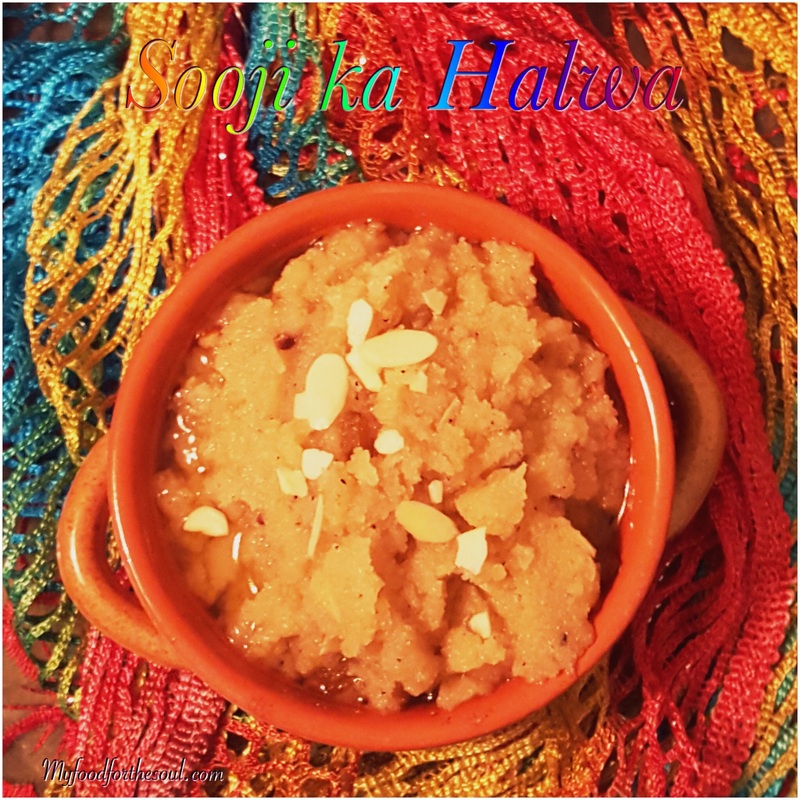 Sooji ka Halwa also known as "Sheera" in Gujarati is a all time favorite sweet dish that can be served as a dessert, breakfast sweet dish or prepared for special occasions or festivals. Heat the ghee in a broad non-stick pan; add the semolina and sauté on a slow low-medium heat for 6 to 10 minutes. , while stirring occasionally. The color of semolina should slight change to a golden brown and should be able to smell the aroma of the ghee/semolina mixture. Add the milk very slowly a little at a time; mix well and cook for 5-8 minutes, while stirring continuously until the milk is absorbed into the semolina and the ghee is starting to separate. Add the sugar, raisin, charoli, almond slivers, elachi powder and saffron mix well. Keep stirring occasionally until the sugar is absorbed and ghee starts to separate. Remove into desired bowl; Garnished by sprinkling a little elaichi (cardamom) powder on top and slivered almonds and serve. Dry fruits of your choice can be added. Adjust sugar to your liking.